When a recipe calls for almonds, it may list a type that you don't have on hand and you may wonder what measurements are equivalents. 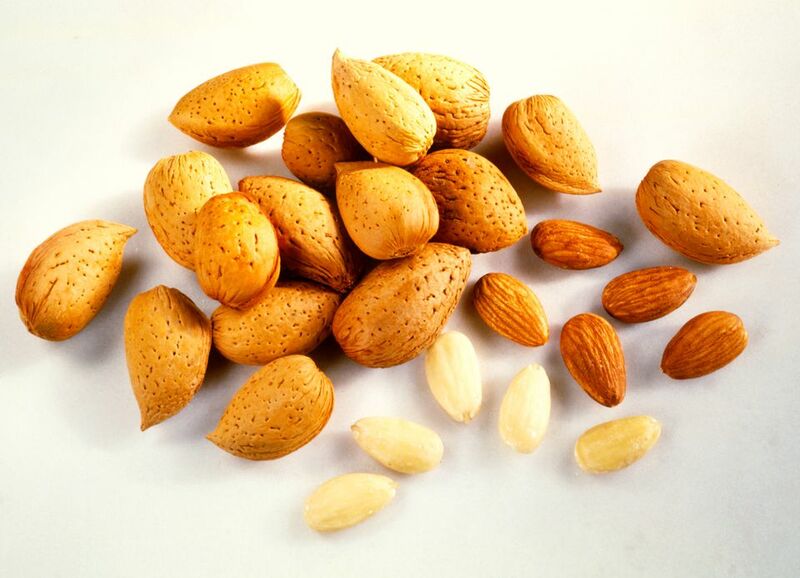 Almonds come unshelled, shelled whole, sliced, chopped, slivered, ground, flaked, almond flour, and in almond extract. Recipes can also call for unfamiliar measures, such as ounces or grams when you don't have a scale handy and would prefer to use cup measures. If you have an allergy or dislike for almonds, learn what you can substitute, including substitutions that are not nuts. You shouldn't need to make a measurement conversion if you are substituting raw, blanched, or toasted almonds. You can use them measure for measure. However, there could be a difference in the taste and consistency. If you are using almonds in breads or muffins, you'll find that toasting the almonds first not only brings out the wonderful flavor, but it will also keep them from sinking into the batter. If you are grinding your own almonds for ground almonds, you may need to check the yield that you get, as it can vary with the amount of processing you do. Almonds are often used to add crunch and texture as well as flavor. The best stand-ins for almonds that are nuts are hazelnuts, Brazil nuts, cashews, and unsalted pistachios. It's best to substitute those with the same sort of texture (such as sliced for sliced, chopped for chopped). If you are substituting due to a nut allergy, consider using unsalted pumpkin for sunflower seeds, crisp rice cereal, granola (without nuts), or oatmeal. These will all add some texture or crunch. If you want to leave out nuts but add flavor interest, consider raisins, dried cranberries, or chocolate chips. You will need to adjust the measurements and there may some changes in the consistency of baked goods when you make a substitution. Amaretto liqueur can stand in for almond extract, but you'll need to use four to eight times as much to get the same amount of almond flavor. Vanilla extract is often used as a nut-free substitute for almond extract, but you would use twice the measure.